The first part of this book reviews the basics of atmospheric chemistry, radiation transport, and optical spectroscopy before detailing the principles underlying DOAS. The second part describes the design and application of DOAS instruments as well as the evaluation and interpretation of spectra. The recent expansion of DOAS application to the imaging of trace gas distributions by ground, aircraft, and satellite-based instruments is also covered. Measurement techniques form the basis of our knowledge about atmospheric composition and chemistry. Presently, important questions of atmospheric chemistry center on urban pollution, free-radical chemistry, degradation of greenhouse gases and the budgets of tropospheric and stratospheric ozone. Among the many different optical spectroscopic methods that are in use, DOAS has emerged as a universal technique to measure the concentrations of atmospheric trace gases by making use of the characteristic absorption features of gas molecules along a path of known length in the open atmosphere. This book reviews the basics of atmospheric chemistry, radiation transport, and optical spectroscopy before detailing the principles underlying DOAS. 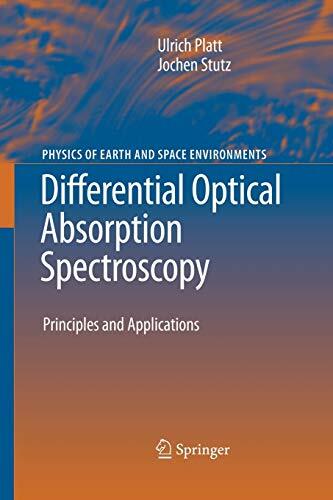 The second part of the book describes the design and application of DOAS instruments as well as the evaluation and interpretation of spectra. The recent expansion of DOAS application to the imaging of trace gas distributions by ground, aircraft, and satellite-based instruments is also covered. Written for graduate students and researchers with a general background in environmental physics, this book especially addresses the needs of those working in the field of atmospheric chemistry, pollution monitoring, and volcanology.